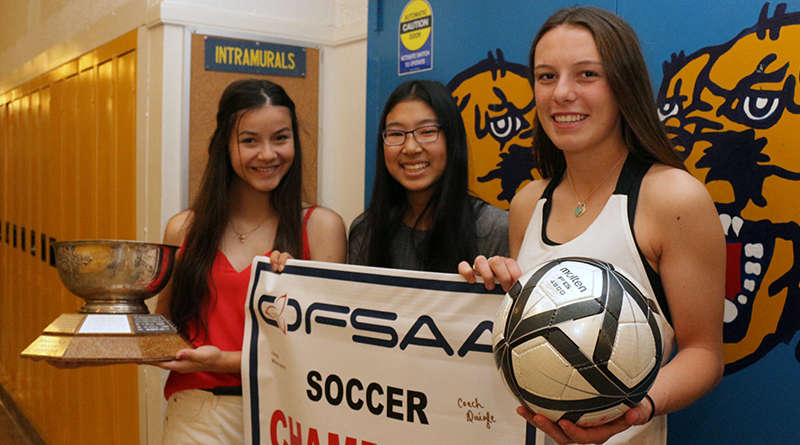 BRIAN BAKER/STREETER NOT SO GREEN: Grade 9 Jamie Dorovenis, left, and Grades 10 Lauren Yoshida and Alyson Reeves provide some experience coming back next year, as the Lawrence Park CI girls' soccer team won OFSAA gold. It was exam week at the Chatsworth Crescent school when Jamie Dorovenis, Alyson Reeves and Lauren Yoshida shared their golden elation. It’s true, the crew had to win by two goals in order to advance further in the playoff round. They did so, handily, putting up five goals against Donald A. Wilson of Whitby, winning 5-3. Three of those goals came from overtime, as the troupe was buoyed by multi-goal games from Quinn Johnston and Maddy Skinner. From that moment, they improved on their 2017 OFSAA showing, advancing to the semifinals against A.B. Lucas Secondary School of London. They won that on a lone goal effort by Danielle Konig. Reeves earned the shutout. In the final, the team ousted Dr. Frank J. Hayden of Burlington 2-0. Grace Reszetnik and Maddy Skinner put up the goals, while Reeves netted another shutout. Though a bulk of the team’s scorers are seniors, the core will be back, and that’s a good thing for head coach Doug Hunnisett, who lauded his sophomore goalie for making some key stops. For 2019, the team looks to be strong. Reeves will be back between the pipes, and the midfield Yoshida will rejoin Dorovenis. As for a successful year at the provincials, across multiple sports, across multiple teams, to the Panthers’ sports is where their family is. Other members of the soccer family include Ariana Bill, Sarah Clegg, Paige Wedner, Jamie Samson, Claudia Kuzmich, Beatrice Ahmed, Emily Carew, Arden Parker, Breah Tanner, Zoe Peres, Emma Mazzei, Olivia Rizakos, Sofia Girling and Sydney Dyck.